A UT administration’s scheme to allot itself the Chandigarh Housing Board (CHB) flats moved a step closer to fruition with the names of over a dozen IAS, IPS, PCS and HCS officers along with almost an equal number of civil judges figuring in the list of eligible candidates for the housing scheme floated for UT employees. High drama prevailed at the Sector 22 Shastri Market when MC employees were manhandled by an unruly mob of shopkeepers who were protesting against an anti-encroachment drive this afternoon. 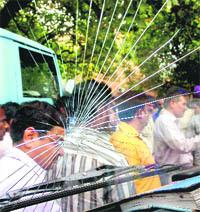 The irritated mob also broke the windscreen of vehicles of the MC enforcement staff soon after the drive started. Mohali can now look forward to a much improved and reliable public transport. In its 35-year history, the city will have a fleet of low floor air-conditioned buses by early next year. With Karva Chauth just three days away, UT government school students have their hands literally full; not with books but with heena cones. In what seems to have become an annual ritual, students, including those of classes X and XII, have been asked to apply heena on their teachers’ hands and feet. 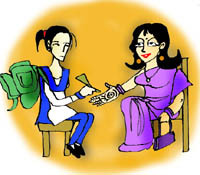 Students of vocational courses are going a step further by stitching clothes for their teachers and that, too, free of cost. 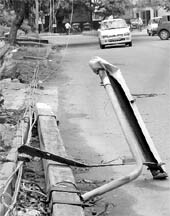 Making mockery of tall claims of tight security in the city by the Chandigarh Police, the snatchers have been on the prowl of late. Four snatching incidents at different sectors, including one unsuccessful attempt and one theft today, just corroborated the fact that the law and order situation is not up to the mark here. The offer made by the Canadian government to offer USD 20,000 to USD 25,000 to the families of each Air India Kanishka victim has been described as a mere joke by Amarjeet Kaur, widow of Kanishka co-pilot SS Bhinder. Prominent poets regaled audience at a poetic symposium Shaam-e-Ghazal organised by the Chandigarh Sahitya Akademy at the UBS auditorium, PU, here today. Young artistes brought alive the diverse cultures during the Annual Intra-Regional Cultural Festival organised by the Northern Region Transmission System II of Power Grid Corporation of India at Tagore Theatre here today. A 30-year-old man was injured when a Maxi cab hit him near the old Panchkula chowk on the National Highway- 22 here this afternoon. A national symposium on “New Horizons in Avionic Display-2010” was organised at Central Scientific Instruments Organisation (CSIO) on Saturday. Experts from various parts of the country deliberated upon display technologies, sensors, optics, metrology, fabrication, certification and standards. The Chandigarh chapter of the Merchant Navy Officers Association has contributed Rs 1 lakh towards the Prime Minister’s National Relief Fund for the victims of cloudburst that devastated Leh recently. 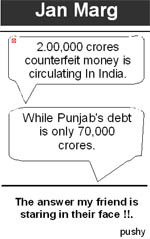 In a report published in Chandigarh Tribune edition dated October 16, 2010 under the headline “`50,000 penalty slapped on Thomas Cook”, it was erroneously mentioned that Thomas Cook was asked to pay the compensation. In reality, it was AM Travels in Sector 9 that was asked to pay the sum. The error is deeply regretted. 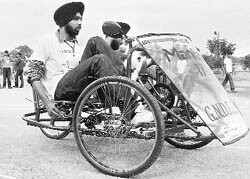 University Institute of Engineering and Technology (UIET), Panjab University, today hosted a national-level event “Efficycle”. The event was organised by SAE (Society of Automotive Engineering). Around 17 teams from institutes like IIT-Roorkee, NIT Rourkela, IGIT, Delhi, Madras Institute of Technology, Mulana Azad Institute of Technology, BITS Pilani, KIET Ghaziabad and NIT Jamshedpur participated in the event. Pending land acquisition process in connection with the Pinjore-Kalka-Parwanoo bypass four-lane mega project of more than Rs 300 crore is getting delayed. The official sources in the National Highways Authority of India (NHAI) confirmed that non-completion of land acquisition process near Bitna village, Kalka, had caused delay in the bypass construction work. A driver of a Mercedes car was shot at outside a marriage palace here late on Friday late night. Undergoing treatment at the PGI, Chandigarh, the driver, identified as Randhir Singh of Nangal Singha village in Kurali, survived three bullets. The body of a local youth Sumit Gupta (25) was recovered from a drain adjoining ITI on the Saheed Garh road. 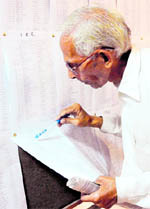 He was missing since October 19 and a complaint was lodged with the police in this regard by his family members. The CIA staff has busted a gang of liquor smugglers and booked five persons. They recovered a car and 50 boxes of liquor from the accused. This gang used to smuggle liquor from Chandigarh to UP and Uttaranchal. The Blood Donors’ Society, Bassi Pathana, organised its 96th blood donation camp at Aggarwal Dharmshala here today. A team of doctors from the PGI led by Dr Usha Rao conducted the camp and 70 units of blood were collected. Delhi Public School, Ambala, organised a folk dance contest here today. 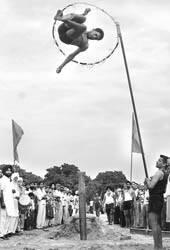 Various DPS schools of Haryana took part in the competition. The school teams presented folk dances of Spain, France, China, Japan and India. An educationist Padma Vivekanandan was the chief guest. A two-day national conference on “Advances in Digital Signal Processing” attended by experts from all across the country concluded on the Chitkara campus here today. Chief Judicial Magistrate JS Sidhu today sent Satbir, who had been arrested in the firemen recruitment scam, to one-day police remand. Seeking police remand of three days, the investigating agency said the CBI was yet to trace the unknown persons who were involved in the scam. The accused has not revealed the facts to the investigating agency as yet thus the remand was required. The local police arrested six persons for gambling from a house in Sector 21 late last night and recovered Rs 1,02,600 besides seizing three cars of the accused. The accused were booked under Section 13,3 and 67 of the Gambling Act at the Sector 5 police station. Later, all accused were released on bail after they furnished personal bonds this afternoon. The Chandigarh Police claimed to have arrested three vehicle lifters, including a juvenile, from a ‘naka’ at Sector 22 last night. The miscreants have been identified as Dalip Singh (21), a resident of Sector 19 here and Arun Kumar (18) from Rohtak. The juvenile offender hails from New Delhi. Ashwini Khanna , a businessman of Sector 32, alleged that a youth took away Rs 65,000 from his office here today. In his complaint, Khanna alleged that the youth, who seemed to be in his early twenties, came to his office when he was busy on the phone. Barwala beat Barona Kalan 27-6 to enter the third round of District-Level Kabaddi Tournament being organised by the Sports Promotion Society (SPS) at Khatauli village in Barwala block.